Leica binoculars are renowned for clarity, color and ergonomics - The Leica Ultravid HD-Plus and Duovid binoculars are a great choice in an outstanding line of birding binoculars. Their Trinovid series binoculars are mid-priced and are the first Leicas with a close focus under 6'. All Leica binoculars are built by hand in Germany to meet the most rigid performance specifications in the industry. 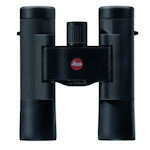 Leica Geovid Rangefinding Binoculars can be found in the Leica Rangefinder section of this site. 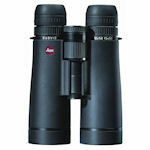 Leica Noctivid Binoculars are Leica's top of the line. 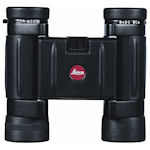 Available in 8x42 and 10x42, they feature high light transmission, excellent fields of view, close focus, and eye relief. 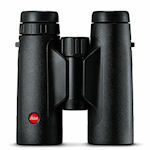 Leica Ultravid HD-PLUS binoculars add Schott HT glass and improved coatings to the original Leica Ultravid HD binoculars to produce a brighter image with better contrast across the entire visible spectrum. 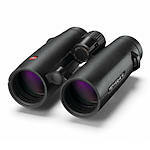 Leica Duovid binoculars are like two pairs of premium binoculars in one frame. Featuring traditional superb Leica optics, Duovids offer two magnifications with the flip of a switch. Duovids come in 8+12x42 and 10+15x50 configurations. The lower power is brighter while the higher power provides that extra bit of detail on a distant target. Leica Trinovid compacts are roof prism designs in 8x20 and 10x25 configurations, featuring a double hinge design to fold down extra tightly. Trinovid compacts offer outstanding resolution in a tiny, water-resistant, durable package for maximum convenience. Leica Trinovid HD Binoculars are close-focusing, mid-priced binoculars available in 8x42 and 10x42 with HD glass and many of the features of the Ultravid HD. 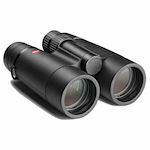 Leica Ultravid compacts are premium performance roof prism binoculars. These ultra-rugged and ultra-bright binoculars come in 8x20 and 10x25 configurations with either rubber or black leather armoring, and use a double-hinge design to fold down ultra compactly. Ultravid compacts weigh 9 oz. or less.